So last week, I wrote about a tweet that I received that in return allowed this package to arrive in Korea for my kids. The students from Mrs. Krebs’ class in Iowa sent us some of their favorite American candy. 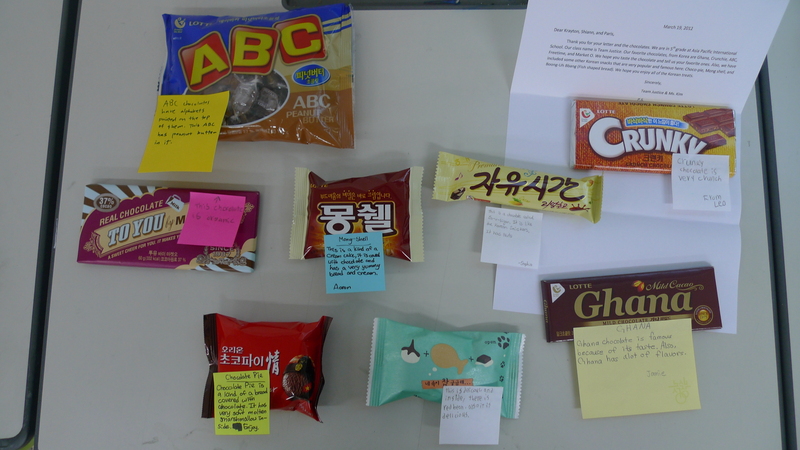 In return, that asked us to send us some of our favorite Korean chocolates. Here is our response of some of our favorite Korean chocolates and also some of the well known Korean snacks. I had the students write a little description about the chocolate or snack. We mailed the package on Monday. Hopefully they will get it in a few weeks! I hadn’t seen this post yet! You and Melody are such busy bloggers! I am not keeping up. Anyway, thank you again so much for the delicious and interesting chocolates and snacks. We all tried some, and the girls read all the little notes to the class of 8th graders. We were all fascinated. They are still working on reporting back. They have such a nice group of people who have sent them chocolates–not only you in South Korea, but also the UAE, Argentina, Australia, and France. I will be sure to let you know when they finish their report! Thanks again for making their day! Anyway, thank you again so much for the delicious and interesting chocolates and snacks. We all tried some, and the girls read all the little notes to the class of 8th graders. We were all fascinated. They are still working on reporting back. They have such a nice group of people who have sent them chocolates–not only you in South Korea, but also UAE, Argentina, Australia, and France.